I am a single pensioner and am a new member. I am looking for long term pensioner accommodation at a resort near the sea. I am an avid rock and surf angler and also own my own ski boat which i launch from a club in the durban port. I am looking for (permanent) accommodation in a resort in a park home or similar facility. Margate caravan park has got park homes for pensioners...but dont know about the boat...launch it at Shelley Beach? Go to our website www.flipentilla.com and read up about Bluff Eco Resort in Durban - may well be what you are looking for. I used to live in a caravan park along the South Coast. 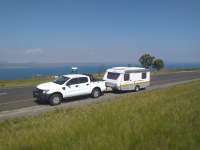 Ocean Call Caravan Park in Winkelspruit have plenty permanents and is 150m from the beach and is not so far South.